As someone who works in the arts, I can have a little bit of fun with my "office wear." So when eShakti offered me the chance to pick out a dress that I could customize to my liking, I was sold. If you haven't heard of them, eShakti is an online clothing retailer that sells both ready to wear and customized clothes. Some of the younger singers that I work with swear by eShakti to get the different dresses that they wear for events and things, because there truly is something for everybody. And if you can't find it on the site, you can customize the clothes to be more of what you want. 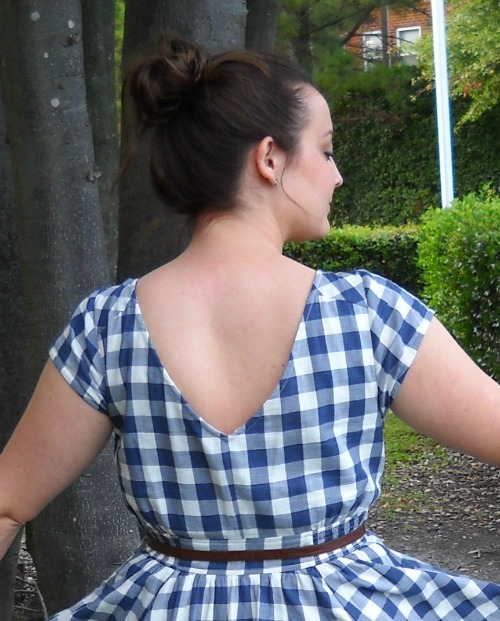 I chose this simple blue and white buffalo plaid dress, but I did choose to customize. I thought that this piece would be great to transition from summer into fall. Summer here in Norfolk tends to last almost into November, with Fall going into December. Originally, the dress was sleeveless, but I added a cap sleeve (which you can see in the bottom photo). I also shortened it to knee length and removed the pockets. Since I am someone with a bit of a curvy figure, it is sometimes hard to find clothes that fit exactly how I want them, but working with eShakti and their sizing was extremely easy. How often do you buy something online, only to not have it fit in a certain place. That would never happen if you can put your personal measurements in for each item. Custom sizing costs $7.50, but is worth every penny. You simply enter your measurements into the fields provided (shoulder, chest, waist, etc) and then your garment comes made for you. So easy. My dress shipped within a few days, and I even received a text right before it arrived so I could meet the delivery man outside. It was packed in a slightly small container which kind of squished it. It just took a bit of ironing to get a couple of wrinkles out. I wore this to work, and got so many compliments. I paired it with a simple belt, cardigan and ballet flats (all from Target), to complete my look. 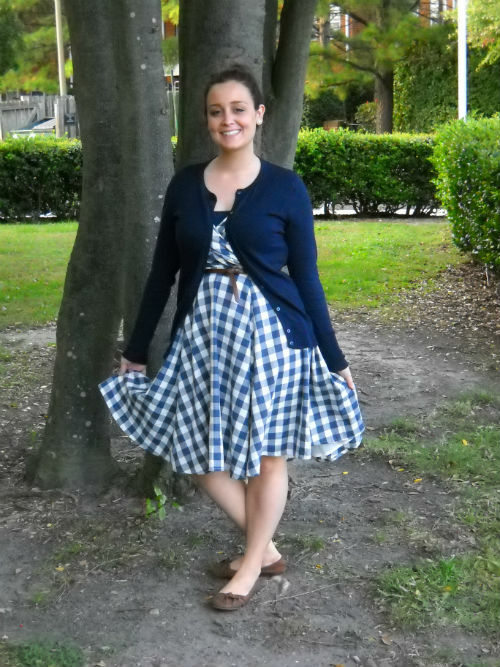 I love the fullness of the skirt, and the happiness of the buffalo plaid. This is definitely going to be one of my go to dresses this fall. When the weather finally starts turning cool here, I'll be excited to pair it with tights! Go check out eShakti on Facebook or Twitter! They always have great sales and promotions going on! Disclaimer: I was provided an item of my choice in exchange for this review. All thoughts and opinions are completely my own. Wow, what a great concept! I love the whole customizing and for the price, I think that is a good deal! I think so too! It is cheaper than buying something and then having it tailored after the fact! Thank you Cathy! Being able to put sleeves on the dress made me feel much more comfortable in it. I've only ordered from them once, but they do make beautiful stuff! 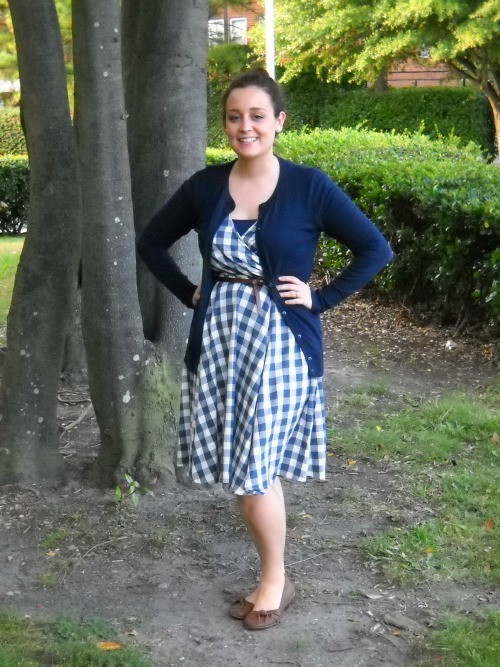 This dress is really cute on you and I love the color scheme and pattern. Thanks! I'll definitely be ordering from them again, especially when I'm looking for work clothes or for something for a special occasion. Sometimes I find myself trolling the mall just to find something "not quite right."